At the foothill of the Sacré-Coeur, the Hotel Montpellier offers you a simple yet warm atmosphere near today's trendlest tourist sites. 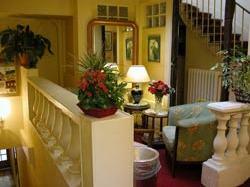 The hotel Montpellier is happy to receive you in a country-like setting of the 18th arrondissement. French picturesque charm, not far from the Moulin Rougeand the classic parisian quarters that date back to the 18th century, the hotel will offer you a quiet and serene stay in the most beautiful districts of the French capital.